Viewing topic "The Society of Motif"
This post will be a little philosophical (most of mine are). It reflects some observations and reflections I made about Motif since the announcement of the Montage. I’ve always been a Yamaha fanboy, P80, QY100,MM8, MOX 8, and just recently I decided to buy the MOTIF XF8 over the Montage. But in making that decision I read so many posts on Motifator, on YamahaSynth, listened to Youtube testimonials and demonstrations and with all of that input, I started to get a true picture of what the Motif really represents. One of my first observations was there seems to be a Motif club. Of course if you own one you’re already in the club, but after reading so many of other’s posts, I realized there are musicians for which the Motif is a goal a dream even. Musicians who don’t own one but look forward to (somehow, someway) owning their own one day. These musicians are also in the Motif club. They admire it, and can tell you anything and everything there is to know about it, even though they don’t have one yet. There are musicians that used to have one and were forced to part with it for one reason or another but still reminisce about the good times with their Motif. These musicians are also in the Motif Club. I saw many others in the Motif club, like magazine editors, producers, sound engineers, sound designers, etc. All who realize the Motif is one of the best Music Production Synthesizers perhaps ever made. But as I started reflecting deeper on the notion of this big world wide Motif club, and reading more of the outcry against the Montage and criticism against Yamaha for not simply improving Motif, I started to see that there is far more here than just a Motif club. After reading all the stuff on the Motif’s 10th Anniversary and how it compared to other synths out there, I started seeing proof of a Motif Dynasty! 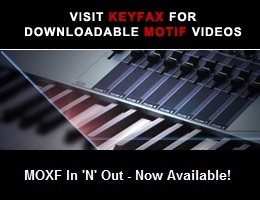 The Motif has simply dominated the high-end Production Synthesizer market for the last 10 years. Yamaha was treating Motif as only a product and perhaps they were not cognitive of the fact that there is a Motif Society out there, and at the very least a Worldwide Motif Club of musicians who see themselves as part of the Motif Era and Motif Dynasty. They didn’t realize that the keyboard represented something bigger than just their flagship product. They didn’t realize that the time and energy investment put into mastering the Motif had catapulted the Motif musician to the stratosphere of music production synthesis bliss. They didn’t realize that the Motif as a concept, as an institution, as a legend has captured the hearts, imagination,and hopes of keyboard players all over the planet. And that to own a Motif made you part of a society , a dynasty, a world that would last and grow forever. So its no wonder when the Montage was unveiled and was not an extension of the Motif but rather a signal for the end of the Motif era, The end of the Motif dynasty, the end of our Motif world, that so many posted and expressed their dismay and disappointment. But perhaps the Montage is not the end of the Motif dynasty. Perhaps when Yamaha realizes that the Montage will never match the magic, mystery and wonder of the Motif, they will assign the Montage as the successor to the DX7 like it should have been, and they’ll refocus on the Society of Motif. That’s an interesting take on Motif owners and “wannabes”. It gives me pause, given my own participation in the Motifator forums ;-) . There are pliers, and then there are Multi-Tools. There are synthesizers, and then there are Motifs. I’ve found it interesting to read posts by some Montage owners, complaining about things that could be done with a Motif being difficult or impossible to do on their Montage. Yamaha has been updating the Montage OS on a fairly regular basis, apparently at least partly in an attempt to somewhat mitigate the issues raised (to the degree possible with Montage hardware). Montage isn’t for me, that’s for sure. I can’t see me stopping using various boards from the Motif range for a long time, or at least until they fall to bits, and that’s if they actually do! I refuse to equate familiarity with, or fondness for, Motifs with Scientology. I don’t approve of “auditing”, although auditioning (of sounds) is acceptable, and I have nothing against application of the “scientific method”. :-) Apologies to any Motifator members who might be Scientologists. I’ve been here about 12 years now and members have come and gone as they have switched to different instruments. I miss the oldtimers who helped me get rolling back in 2005, especially Wellie and Brad Weber not to mention B.M. It’s a lot quieter than it used to be, that’s for sure! out gear as they see something that better fits. But sometimes cats run into financial issues and have to pawn or sell, and they don’t switch willingly. Or sometimes they believe the hype and put down the bird in the hand, for the two that are hiding in the bush. And end up with buyer’s remorse. But I think it is probably rare (very rare) for a keyboard player that has taken the time to really really understand the Motif, the elements, the XA control, the arpeggiators, etc and really have learned how to work with an exploit performance, pattern mode, master mode, integrated sampling, ctlsets and all the rest to just switch to another keyboard. The Motif really rewards those that have taken the time to learn, experiment, perform, and create on it. In fact Yamaha synthesizers in general have a language, and a certain flow, and logic a “musical culture” that requires serious time & investment to really understand and exploit. Once you’ve put that time in, you will not easily and you will not readily switch. Its a simple matter of cognitive dissonance. I think musicians that already own something in the MOTIF line and that have a deep knowledge of their instruments “might” add other keyboards, but I think it is probably “Rare” for those with truly a deep knowledge to simply “Switch” or drop the Motif. I might be out on a limb here, but those that switch are likely not to have put in the miles with the Motif, and can be more easily swayed by some other “Shiny” features on other keyboards. It is likely to be a lot easier for someone to switch that only has surface, casual acquaintance,or light familiarity with the Motif. Now if you’re a casual Motif player, and you have the money, to drop $3k or $4k or $8k on something else then that’s another story. Or if you only play a Motif at church or only play someone else’s Motif and you personally decide to play some other keyboard, that’s another story. The Motif is a culture. Korg Kronos is part of another culture. The Roland Fantom is part of another culture. Once you’re in deep enough in which ever culture its very hard to switch and usually doesn’t make sense to switch because there is just simply not enough justification. I would venture to say that those that jump easily between cultures, haven’t really joined any of them yet. I’ve bought hook line & sinker into the Motif Culture, I’m pretty sure I’m down with Motif for the count. And from a technical point a view I am convinced that if it can be done on a Kronos or Fantom, that the Motif has an answer that suits me. I’ve not gone away, just been incredibly busy - lots of life change going on for me n the fam. Anyways, still loving my classic and making music with it. And loving this thread - a proud Motif owner, user and fan. I had a good play with a montage and it is epic but it isn’t a workstation in a motif kind of way. It sounds great and if I had the cash I’d get one. Anyways.... I would not part with my classic. Will pop in from time to time. As has been pointed out many times (and especially by me) Motifator.com is actually older than the Motif. I was hired by Yamaha as a consultant during its development. Yamaha also licensed many of our Twiddly.Bits MIDI sample loops for Motif’s arpeggios (and they remain, even in Montage!). When it came to the question of how do we launch this instrument to the public I felt that people were going to need help in terms of how to use it. The Keyfax team put together this site. At the time there was no Facebook, no Twitter, no Instagram, no YouTube. Nothing that even described itself as ‘social media’. Heck, Motifator.com was even around before MySpace! But the social element was always paramount in the concept of Motifator.com. We wanted it to be a place where people could freely (and yes we have taken heat over the years for being a little too free!) express their problems, concerns - and successes - with Motif. Obviously no one involved could ever have imagined how the Motif and Motifator would resonate. It was just one of those right things at the right time kind of situations. But ‘Motif’ is a club, society, call it what you will. And what has made it so is not so much us, but you. With one or two glaring exceptions, the hundreds of thousands who have visited this site have been community-minded people looking for simple ‘unbiased’ answers to their questions. As time goes on newbies have become gurus, forum acquaintances have become friends. I don’t know if actual relationships developed, or even marriages, but they certainly could have. Motifator went live in August 2001. A month later the world changed forever. At a time of year when Americans are focused on family (Thanksgiving looms) and a time in the world when all of us could well do with a large dollop of kindness and respect, a big thanks to all MoBros and MoSis’s out there who have been at least - and for the most part! - a beacon of civility in our troubled times. MM, on behalf of the entire Keyfax Team. I usually try to avoid “deep and heated” discussions. The current political climate raises my blood pressure too much without having a “back-and-forth”. The Montage AWM2 component is very similar to AWM on the Motif. 8 waveform Elements per Part (= Motif Voice). Arpeggios are quite similar. My five years of learning to use the Motif were a pretty good introduction to learning some parts of the Montage. Yamaha left out some things from the Montage that the Motif had. Patterns and the sequencer, for instance. But I was already doing those kinds of things in Cubase instead, which seemed a lot easier to me than doing it all through the small Motif screen and the buttons at the bottom of the screen. Yamaha also added new ways of controlling sound parameters via two levels of assignable knobs and the Super Knob. To be honest, I haven’t used any of that very much since I spent the time learning about how to use them. The main thing that’s worse is that I miss motifator and the crowd that hangs around here. I wish that motifator had opened up a Montage forum, and that Yamaha had let Bad Mister stick around here. In addition to the people I miss, the YamahaSynth.com forum software is slow and awkward. It can’t even remember your login, so you have to log in every time. Anyway, I hope you’re all having fun making music. I have the Motif ES and XS and both are still a very viable mainstay of a handful of synths that I have in my arsenal. I’ve played the XF and Montage and other than the manner that it handles storage and few features that are interesting but nothing that is a must have.